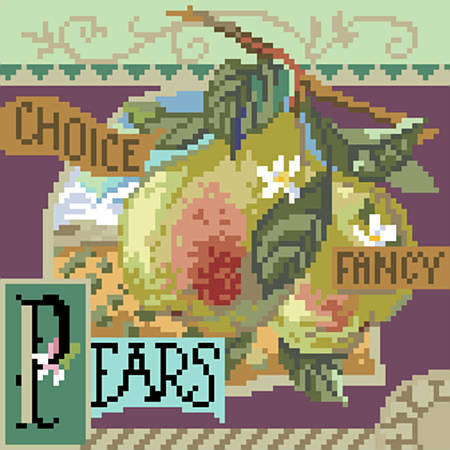 Sweet and juicy, Choice Fancy Pears is one of four traditional crate-label style fruit motifs to add a bright splash of color to any room décor. 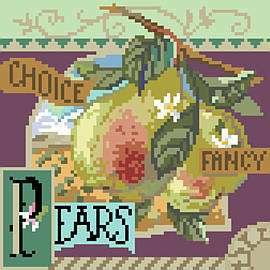 Collect all four: Sweet Oranges, Choice Fancy Pears, Tasty Fresh Apples and Fancy Lemons. This set is designed by Nancy Rossi and are beautifully adapted by Sara Angle. These stitch up to 6” x 6” square on 14 count Aida. Contents: Stitch Count 84w X 84h, Finished Size on 14-ct 6" x 6"